September 2012: Register Now for Campus Rainworks Challenge! The United States Environmental Protection Agency is now registering student teams for the Campus Rainworks Challenge! The design contest for college and university students raises awareness of green infrastructure alternatives for stormwater management. 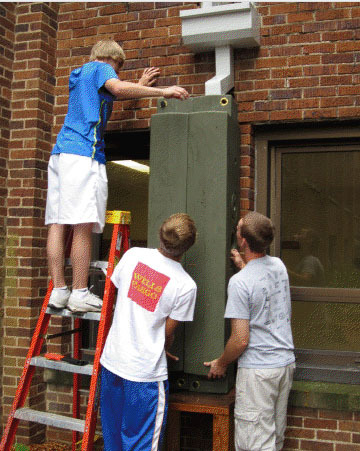 Omaha North High School students install two HOG tanks as part of their 2011 school renovation. To participate, student teams, working with a faculty adviser, must submit design plans for a proposed green infrastructure project on their campus. Teams must register by October 5 and submit their entries by December 14, 2012. Winning entries will be selected by the EPA and announced in April 2013. Our offer to participating student teams: incorporate Rainwater HOG tanks into a winning entry, and we will give you three HOG tanks. Winning teams will earn a cash prize of $1,500 – $2,500 as well as $8,000 – $11,000 in funds for their faculty adviser to conduct research on green infrastructure. The United States Environmental Protection Agency has launched Campus Rainworks Challenge, a student design contest engineered to raise awareness of green infrastructure alternatives for stormwater management. Registration opens September 4 and ends December 14, 2012. Winning entries will be selected by the EPA and announced in April 2013. CA from June 20-24, 2012. 3) GreenBuild in San Francisco Meet Rainwater HOG’s Sally and Simon Dominguez at GreenB,uild, the largest green building show in the USA. The event will be held from November 14-16, 2012 at the Moscone Conference Center in San Francisco. The Green & Main Pilot Project in Des Moines, Iowa. 4) Campus Rainworks Challenge The United States Environmental Protection Agency has launched Campus Rainworks Challenge, a student design contest engineered to raise awareness of green infrastructure alternatives for stormwater management. Registration opens September 4 and ends December 14, 2012. Winning entries will be selected by EPA and announced in April 2013. 5) Hey Bay Area, click on this coupon for 20% off WaterSense smart irrigation controllers from one of our California distributors, the Mill Valley branch of The Urban Farmer Store! This June we’re finding inspiration in unexpected places, like the toy race car featured in B.U.G. Design powered by hydrogen fuel cell technology. But we’re also inspired to see how the concepts of rainwater harvesting and stormwater management are moving into the mainstream. The Campus Rainworks Challenge, sponsored by the EPA, is a great illustration of this. So, if you’re looking for inspiration this summer, you’ve come to the right blog. We also have giveaways and good design (see: Australian beach eco-renovation at Bondi Beach) inside to sweeten the deal. Let’s pause a moment before we go into more detail. At HOG, we love this idea! In fact, we’d like to make an offer to participating student teams. Incorporate HOG tanks into a winning entry, and we will give you three HOG tanks. And what’s the prize? Winning teams will earn a cash prize of $1,500 – $2,500, as well as $8,000 – $11,000 in funds for their faculty adviser to conduct research on green infrastructure. In other words, boys and girls, there’s plenty of time to devise an award-winning, money-making, campus-improving stormwater management plan for your school. An 8-HOG catchment system provides an on-site reserve of water for the Green & Main Pilot Project. Workers install a bioswale in the foreground. stormwater management plan is part of their bid to achieve LEED Platinum status.